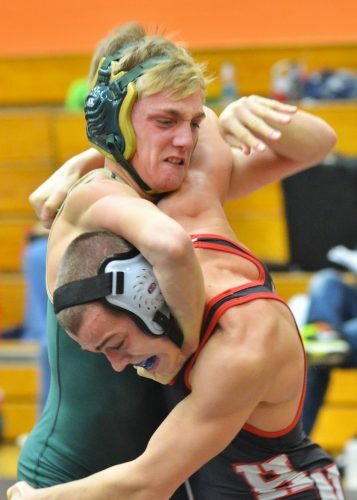 Wawasee’s Braxton Alexander went 5-0 at 120 in Saturday’s invite. He was one of four weight class champions for the Warriors. 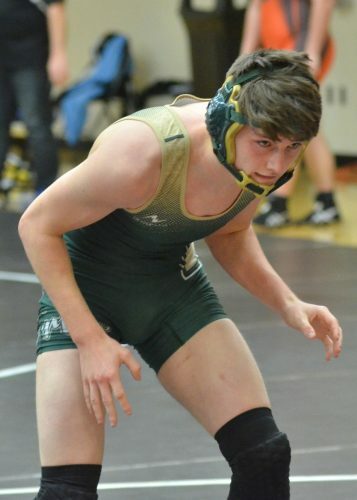 WARSAW — It was big day on the mat for the Wawasee wrestling team as it opened up its 2016-17 campaign with a big statement. The Warriors were the talk of the tournament, going 5-0 to earn the top spot at Saturday’s Tiger Wrestling Invitational. The host Tigers would their day going 2-3 while senior wrestler Kyle Hatch earned tournament MVP honors with a 5-0 record on the day. Wawasee, which was 2-3 at the tournament a year ago, highlighted its day with a thrilling 42-30 victory over Huntington North. Both teams were 3-0 entering the match and the two put on quite the show to back up those records. The Warriors jumped out to an 18-0 lead in the first four matches. 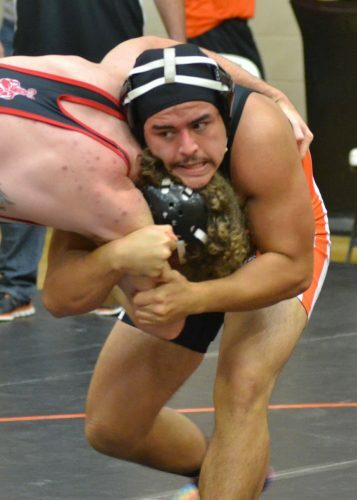 Decisions were grabbed by both Ricardo Romo and Braxton Alexander while Garrett Stuckman earned a win by fall (0:56) and Ashlee Luttrell picked up her first career win by way of forfeit. North then earned wins by fall in the next four matches to take a 24-18 lead. The Vikings would end up holding a 30-21 lead with the final four weight classes still coming up. The Warriors needed a clutch finish to the match and got just that. At 182, Damien Rodriguez pinned Charlie Agnew (5:04) to make the score 30-27. Alex Castro then picked up a 9-2 decision at 195 to tie things up. Jeremiah Dilley’s match with Christian Graff at 220 followed and would prove to be, arguably, the most intense battle of the entire day. The two were very physical and left the mat several times, including one incident where Graff was driven backwards into a group of managers, ultimately tripping over a medical box and falling onto the hardwood surface of the Tiger Den. Dilley finally took control and would win by fall (5:37). 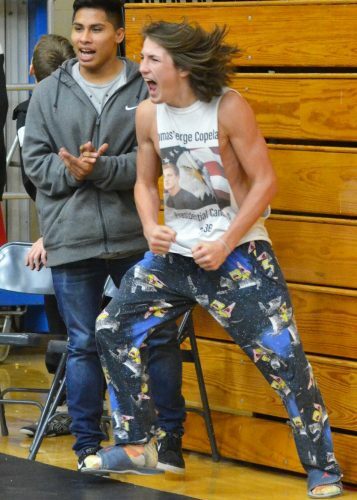 The energy from Dilley’s win spilled over into the heavyweight match where Elisha Tipping made quick work of Scott Faust, earning a win by fall in just 27 seconds. The win was the closest of the day for Wawasee as every other match had a margin of victory of 23 points or more. The Warriors started their day with a 44-20 win over East Noble, carried that into a 54-24 defeat of rival Warsaw then earned a 54-25 win over St. Joe before beating Huntington North. Wawasee capped its day with a 51-28 win over Northrop. Wawasee boasted four weight class champions in the tournament, tied with Huntington North for the most of any team. Representing the Warriors were Romo (106), Alexander (120), Raymon Torres (160) and Tipping (285). All posted 5-0 records. Kyle Hatch went 5-0 at 152 for Warsaw and was named the tournament’s MVP. Hatch recorded five falls and 32 total takedowns on the day. He had the tournament’s fastest fall with an 11-second pin of Wawasee’s JJ Coronado in the second round. Warsaw picked up a 47-21 victory over Northrop in the opening round of the day and later defeated St. Joe 54-30 in the final round. 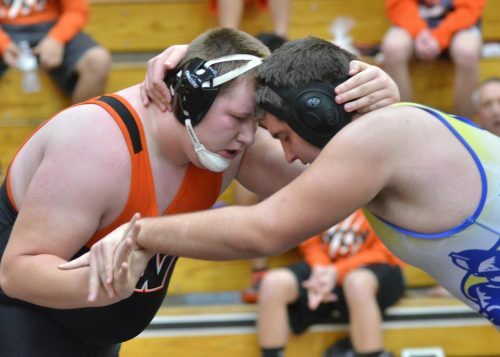 Both Wawasee and Warsaw will meet again this coming Saturday at the November Super Duals in Syracuse. 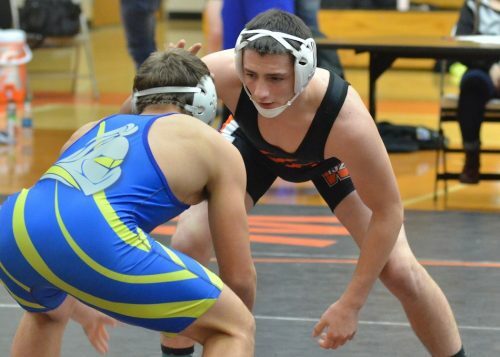 That match between the Tigers and Warriors will count as a Northern Lakes Conference dual match. Competition will start at 9 a.m. in both the main gym and annex gym at Wawasee High School. Wawasee’s Geremia Brooks celebrates after his teammate pins an opponent.